Thanks for stopping by Flawed yet Functional today! If you don’t know, I am a Type 1 Diabetic managing my diabetes through diet, exercise, and healthy habits…that means no insulin. Crazy, yep, who knew it could work?? For more info on insulin-free diabetes management, check here. 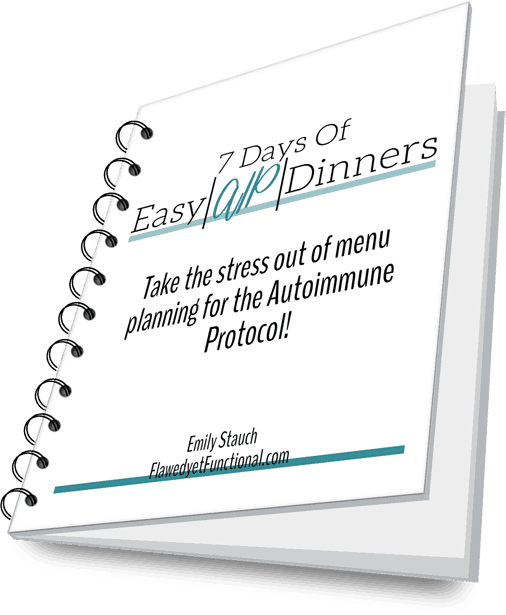 The name of my current diet is the Autoimmune Protocol plus a few reintroductions, and this diet would not work if I was not eating lots of fat. I would have insatiable cravings and be hungry all the time. So while it might not seem intuitive to you, if you are looking for the next step to eating healthier food, try introducing more fat into your diet. Did you miss the first four posts? Check them out below! Doesn’t fat make me fat? Now I know what you are thinking, doesn’t fat make you fat? If you’re old enough to have lived through the 80’s then you probably well indoctrinated into fat = bad philosophy. I believe this is flat wrong. Bad science and analytics came up with these conclusions, and they’ve been proven false many times. However, big pharma makes a killing on the general population believing fat is bad. When you don’t eat fat, you replace it with carbs or just straight sugar. Do you know what sugar does? It makes you fat, and excess fat in the body creates a whole world of health issues. If you aren’t on board with me yet, do a quick Google search for “Is fat bad?” “Does fat make me fat?” or anything similar. Read several articles, follow footnotes and sources. Don’t believe the first thing you read. You will be convinced in short order. Why should I eat more fat? Now that you know fat is good for you, why should you be eating it? Why is it a part of these Baby Steps to Eating Healthier Food? You will be hungry and insatiable if you don’t eat enough fat. Incorporate fat into your diet so that you will be content with your food changes and stick to your new lifestyle long-term. Recall back at Step 1, this is a new lifestyle. This is not a fad diet or a desperate attempt to ditch 20 pounds fast. You are taking control of your long-term health now and for the rest of your life. Whole, real foods will allow you to live the most full, energy-filled life you ever thought was possible. Don’t ditch all that effort you’ve made so far because you are hungry all the time. If you are hungry, that’s your body telling you that something is wrong. A well balanced diet high in fat will not leave you hungry between meals. How do I eat more fat? Eat Fatty Veggies – Avocados are your best friend. Eat a half of one with your breakfast, lunch, or dinner. Wrap the other half in plastic wrap and keep it in the fridge to eat at the next meal. It will barely turn brown, trust me. It will last! Add Fat to Plain Veggies – Want an extra dose of yum or just to help swallow a cooked vegetable you don’t like? After you’ve served up your plate, put a generous tablespoon of coconut oil over the roasted vegetables. You won’t believe how good vegetables taste when they are drowning in coconut oil, and you won’t believe how satisfied you are after the meal! Don’t like coconut oil? Try olive oil, butter, or even bacon fat! Oil the Pan – Don’t skip greasing the pan when you begin cooking! Not only does this help the food not to stick to the pan, it adds good-for-you fat right from the beginning of the cooking process. Snack on Fat – Going out on a limb here, I’m not saying that pork rinds are healthy to eat all the time, but if you are having a craving in between meals, try reaching for a high fat snack (or water, don’t forget to drink that!). My go-to high-fat snacks is pork rinds, whole almonds or pecans, nut butters, and olives. Eat the Fat on Meat – Gasph! Did you know that you can eat the fat on your meat? Not all of it is delicious, but here are some that are: crispy chicken skin, fat surrounding a broiled pork chop, bacon, and nicely marbled steak. Basically, if there’s just a bit of fat surrounding your meat, try to eat it. Don’t trim off every speck of fat. Your meals will taste better for it. Other ideas – Cheese and eggs are also a great source of fat, and while I, personally, can’t eat them, if your diet allows it, then go for it! So that’s the low-down on fat. If you want your diet changes to stick then do yourself a favor and eat more fat. Fat will help fill you up at meal time, and it will keep you full between meals. Don’t take my word for it though! Do your own research, and when you do, come back here and share. What did you find? What did you learn? How are you going to change your diet in regards to fat intake going forward? 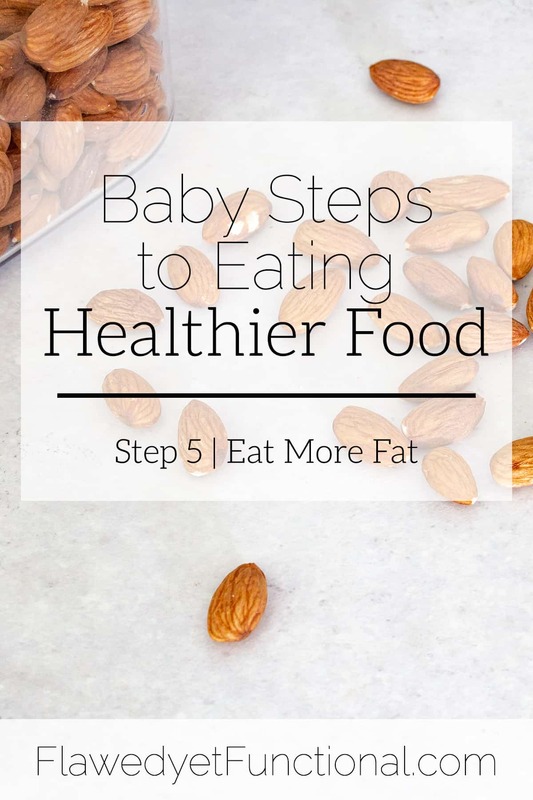 Don’t miss out on the other Baby Steps to Eating Healthier Food! Take a read and begin changing your diet today! Heart disease runs in my family. I have been able to maintain a borderline cholesterol level through diet and exercise. But I have to limit my “bad” fat, including full fat dairy products and red meat. Also, I have been told that pork products aren’t healthy to eat and have avoided them for the most part. I’m wondering if you have done any research on that. Really good question! I haven’t researched too much into heart disease specifically, but it comes up in documentaries I watch. It is my understanding that build up in the arteries is due to sugar and processed foods, not fat. I don’t have a source to cite right off the top of my head, but you should dig into it. Did you see my 1 year results of being an insulin free type 1 diabetic? My cholesterol improved dramatically. I’ve always had borderline low HDL, and now it is superb on a high fat, low carb diet. I will have to do more research for sure! For most of my life I have been told that fat is the enemy, so this is so interesting to me! I grew up with low fat…but highly processed…foods. I’m just going to have a hard time giving up that sugar!! I know! Sugar is hard to give up, but the cravings do subside after a while!